Update June 24: Microsoft's Office suite is now officially available for Android smartphones. The gamut of Word, Excel and PowerPoint apps are available for download (for free) from the Google Play Store. After having been available for Windows Phone, iPhone, iPad and Android tablets, an improved Office experience is now headed to Android smartphones. In this initial release, Office for Android phones is only available as a beta, or preview, with three apps in the Google Play Store – Word, Excel and PowerPoint. "The Office for Android phone apps are modern, optimized for touch and designed for work on the go," Microsoft said of the experience in a statement. "Familiar navigation and menu options in the ribbon are placed at the bottom of the screen within reach of your thumbs so you can easily review and edit documents on your phone." In order to download the app, you must join Microsoft's Office beta program for Android devices. You'll need to join the community, and opt to become a beta tester for Word, Excel and PowerPoint. It may take up to a few hours for your beta request to register, but once that happens you'll be good to download the apps from the Google Play Store. According to Microsoft, you can create, open, edit and save files in the cloud from your Android phone so you can access them through services like OneDrive, SharePoint, Dropbox, Google Drive and Box. If you're collaborating with others on a project, Office for Android phones allows you to track changes, comment and markup documents. 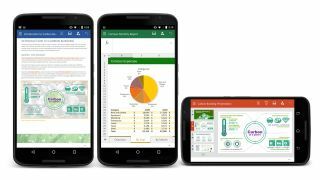 Office for Android smartphones will compete with Google's Docs, Sheets and Slides apps along with a number of third-party Office alternatives. During this preview period, the Office Mobile app for Android phones will continue to appear in the Play Store. "We will disclose more about our plans for this app later in the year when we announce general availability of the new Office for Android phone apps," Microsoft said.